Posted on May 21, 2014 by Ching under Family, Hobbies. 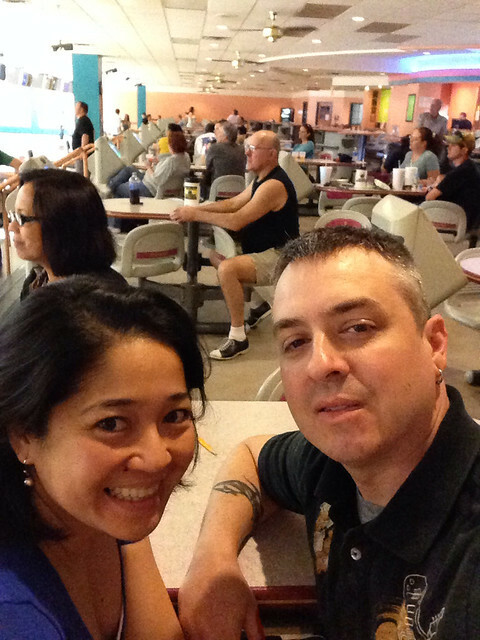 After over a decade of marriage Brian and I finally joined our first bowling league. It’s a mixed league at Derby Bowl on Sunday nights. We are on a team with mom and dad. We named our team ALOBAKER because it’s a combination of our last names. Not very creative, but it works. LOL. Our first league night was last Sunday. We had to be there early for a league meeting, to make some decisions about what to do about the holiday weekend, prize pool, etc. We also had to pay our sanction fees. The guy in charge of the league gave us the option of paying $21 to be sanctioned for a full year or $10 for just the summer league, which is an option if you’re not interested in being eligible for awards. Brian asked what option I wanted. He was leaning more towards just paying the $10 because he didn’t foresee joining another league after this one ends. I was like, “Hello? Do you know who you’re talking to?” I want to get awards! We both opted to pay the full sanction fee. Dad hadn’t bowled in a league in several years so he had to pay the sanction fee as well. Mom was already a sanctioned member. Since the three of us were new league bowlers we had to set our averages. I wanted to set a low one so I could get a higher handicap. I think that was the plan for all of us. It was not to be, though. Dad bowled amazing. I bowled pretty well too despite all my efforts to sandbag. Mom says the more you try to sandbag, the more relaxed you are and you actually end up bowling better. Let me explain the whole bowling handicap concept. The idea is to add points/pins to the score to make the game more competitive for less experienced and expert bowlers alike. 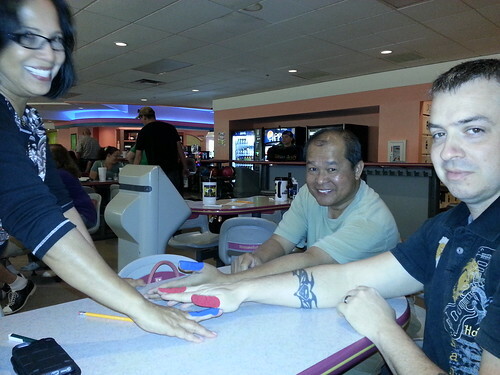 Without the handicap the better bowlers will always win and it wouldn’t be as much fun playing. Handicaps equalize the playing field so as long as you bowl your average game or better then you have a fair shot at winning. The handicap is based on a percentage of the difference between a bowler’s average score and the basis score. For our league we agreed upon a bowling handicap of 90% of 210. Since I bowled an average of 150 over three games last Sunday, my handicap is 54. This means that when we bowl next week I get to add 54 points to my total for each game. This is why I wanted to set a low average. I was actually going for 130 which would have given me a handicap of 72. Knowing that I’m fully capable of consistently bowling an average of 150, that would have given me a 20 pin advantage. Now imagine if Brian and dad sandbagged also. We’d win every week! Alas, I set my normal average. I tried to sandbag, but it didn’t work. Mom blames it on the law of averages — the belief that outcomes of a random event will tend to even out. For instance, she bowled 192 on her first game and 200 on her second game. Guess what she scored on the final game. She bowled a 109. It is a terrible game by mom’s standards but she explains it away as the law of averages at work. Mom’s average is around 170. The average of her three games that night is 167, not far from her typical performance. So she predicted that she would bowl a lower scoring third game because the law of averages assumes that it has to balance out. I believe in the law of averages over the long term, but I avoid thinking about it or using it to explain events because I think it then becomes a self fulfilling prophecy. If you bowl two great games as mom did and you believe that the third game will be crappy (because of the law of averages) then that’s exactly what will happen. Why? Because energy follows thought. I think mom was fully capable of bowling a 600 series that night. She’s done it before so it wouldn’t be such a fluke. She just had to believe that she could do it rather than thinking that the third game was the balancing event according to the law of averages. As for me, I intend to bowl better than my average every week from here on out. I want to win some awards, darn it!